I have run the NYC Marathon 3 times, and three more marathons elsewhere. I’ve dealt with adversity: under-training, under-tapering, near-fainting, horrific cramps, and hunger so bad I nearly chewed my fingers. My last effort was nearly perfect, because I finally learned how to prepare properly in the last few days before the race. Here's how you can do the same. Yes, it’s maddening. But no, you’re not ruining all your training by taking it easy these last few days. Relax, continue to recover, the race will come soon enough, and your legs will be ready. As one runner Tweeted, "undercooked is better than overcooked." Tapering too much is WAY better than tapering too little. Take it easy! If you're in the NYC area and struggling with an injury and worried about it impacting your race. contact Jill Cherland via email at Cherland10@Gmail.com. She's skilled at acupuncture, muscle activation and other techniques for healing you and getting you to the starting line. She has fixed me up several times in the weeks before a race. The most important thing you can do in the last weeks before the race is to eat smartly, right through race day. I took this for granted and thus screwed it up badly in my fifth marathon, and had my most disappointing effort. I got it precisely right in my last, and ran my fastest final 10K ever, even though I hadn't trained very much. For the 7 days leading up to the race, food is fuel that will drive your engine on Sunday. Hydrate adequately (but don't overdo it!! ), and eat LOTS of fruit, veggies, the right kind of carbs, and protein. For more on this, read What To Eat in the Week Before the NYC Marathon. The weather can change drastically right up to race time, so be prepared for anything! Regardless of the forecast, there are two things you need to know: first, the early morning wait before the start will be very cold; even if you are checking a bag, you have to turn it in about an hour before the start, so plan to have a throwaway blanket and lots of throwaway clothes. Second, the weather may warm up by mid-race, causing you to toss your hat, gloves and extra shirt – and then temps may drop again in the later miles, leaving you freezing. Thus, if there is any chance the weather will turn cold, carry with you an extra hat and gloves. For more on this, read What To Wear in the NYC Marathon. This area is crowded and uncomfortable, and you spend most of it waiting on a bathroom line and talking to other runners. If you are checking a bag, don’t wait too long to bring your baggage to the truck, it can be a chaotic process that leaves you sprinting to the starting line! I watched last year's marathon as a spectator and was utterly sickened to see that almost half the runners were wearing headphones. You are running in the greatest city in the world - with 2 million spectators of every nationality cheering you on, shouting your name, imploring you to keep going - and you're listening to Lady GaGa? Leave your iPod at home and embrace the experience. There will be times in the first ten miles when you are very crowded; at times it will open up nicely, then get crowded again as waves come together. Don’t sweat it, and don’t waste a lot of energy zig-zagging. Go with the flow and know that it will clear out by about Mile 10, letting you run the final, most important 16 miles unimpeded. There are three separate groups crossing the Verrazano - one on the upper left, upper right, and then lower - and they eventually join back up, one at a time. While you are assigned to a certain wave, it is likely you'll be able to decide, BEFORE THE START, whether you want to run on the left or right hand side of the bridge. If the weather looks warm and sunny, try to start on the right side of the upper level of the bridge - this means you run several miles in the shade on 4th Avenue, while the left side people run in unprotected sun - this makes a BIG difference. Conversely, if it is cold, you may prefer the sun, so run on the left side of the upper level. HOWEVER, ONCE YOU CROSS THE STARTING LINE, YOU CANNOT CROSS FROM ONE SIDE TO THE OTHER - YOU WILL END UP RUNNING EITHER 25.7 OR 26.7 MILES, SINCE EACH SIDE TAKES TURNS VEERING OFF FOURTH AVENUE FOR A HALF MILE. Running across the Verrazano is an unbelievable experience - the views are stunning – NYC Skyline, Statue of Liberty, fireboats in the harbor spraying water. The first mile is straight uphill, but you don't feel it much since you're fresh and pumped; the second mile is a nice, rolling downhill, to the end of the bridge. DO NOT WORRY that you will freak out on the bridge. I thought I might the first time, and I know others who felt the same way, but I've never seen anyone actually do it. When you are up there, it is not intimidating - but be forewarned of a phenomenon called "simultaneous lateral excitation" - thousands of pairs of feet hitting the bridge in the exact same direction at once cause it to shake, and it feels like the ground is shifting underneath you, like you're running in Jello. It takes about 3 seconds of nervous laughter till everyone gets used to it. Coming off the bridge, you run straight up 4th Avenue for about 4 miles, then weave 4 miles through ethnic neighborhoods in Brooklyn. These crowds are the best you'll see - spirited, proud of their heritage and eager to share it with the runners. 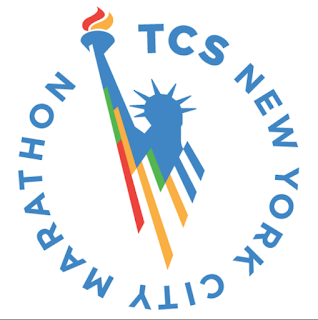 ENJOY THEM - they are what makes New York City, and the NewYork City Marathon, great! The halfway point is on the Pulaski Bridge, going into Queens. It is fairly steep, but not very long. You then run around Long Island City and onto the 59th St Bridge, the hardest part of the race. It is a long climb, somewhat similar to the Verrazano, though not quite as steep or long; it rises 110 feet over a 3/4 mile stretch to the top. There is no crowd support, and you're on the lower level, so it's dark and dank, the mood of all the runners drops, and you run seemingly forever before you even get over the water. I found it very hard the first two times, as I was not in top shape, but a bit easier the 3rd time. EMBRACE the solitude and gear up for the last ten miles. Beware of the down hill of the 59th St Bridge - it is a short, steep, spiraling drop, and the 3rd time I wrenched my back a bit by taking it too fast - nothing too bad, but any little thing at 16 miles is a big thing. Running up First Avenue is fun - a rock star experience - the crowds are gigantic and boisterous and loud - but they are mostly obnoxious drunk young people, not nearly as interesting as the crowds in Brooklyn. Make sure not to get carried away by the crowds; many runners have ruined their race by going too fast down First Avenue. When you get near the top of First Avenue, past 100th St or so, the spectator crowds thin for the only time of the race; you cross a bridge at 138th St., then run a mile in the Bronx, then came across another bridge back into Manhattan. You then enter Spanish Harlem and Harlem, which are interesting places to look around, and then end up on Fifth Avenue for a long run down to the entrance to the Park. The crowds on Fifth are fantastic because they are right on top of you; but they also shout "you're almost finished" when to you, three miles away is NOT almost finished. You enter the Park around 5th and 89th, and 8 blocks into the park, you get a fantastic, long, sloping downhill, that is rudely followed by a short, steep uphill - be ready for it so you don't come to a dead stop. You then run down to 59th and out onto Central Park South, then go back into the park on the West Drive, to the finish. A virtual tour of the course created by a 2010 runner using data from his GPS system. An ING "Runner Cam" that appears to by someone who drove the course. Read our post, 8 Ways to Support Your Loved One in the NYC Marathon, for info on how to make sure your friends and family see you during the race.